The Apple Store Boylston Street in Boston, Massachusetts is the largest Apple Store in the United States, built three stories high with a modern glass and stone exterior that was a big departure from the typical Apple stores built before it. The Boylston Street store also boasts a unique rooftop garden, although it is not accessible to store customers. As the largest Apple Store in the United States, this Boston location includes two floors dedicated to Macs, iPhones, and iPods, and a 3rd floor dedicated to services such as the Genius Bar and opportunities for One to One training. The location of the Apple Store on Boylston Street is directly in the heart of Boston’s historic Back Bay, an area once used primarily for milling operations in the mid-19th century. However, the area of tidal flats was gradually filled by earth and more than 450 acres of land was created that could be built upon. In 1865 architect Arthur Gilman developed plans for Back Bay, a residential district that was inspired by French architecture. Commercial buildings first started popping up on Boylston Street in 1880, and over the years Back Bay became home to respected artists, authors, and philosophers like Oliver Wendell Holmes, George Santayana, and William Morris Hunt. In more recent times, the location of the Apple Store Boylston Street was a simple copy shop. For several years Apple reportedly eyed the site, working closely with the Boston Redevelopment Authority, along with officials from the city of Boston, to ensure that the new store fit the neighborhood. 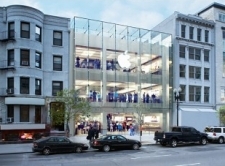 The exterior of the store on Boylston street departed slightly from traditional Apple Store designs in order for the storefront to fit into the existing neighborhood. But this doesn’t mean that the Boylston Street store is mundane, as Apple made strategic plans to develop an environmentally friendly building. The rooftop garden of natural grasses adds greenery to the otherwise very urban setting. The design of the store also makes it possible to collect and filter rainwater, efforts that help to rebuild the area’s Back Bay water table. Natural lighting also helps to minimize electrical footprints made by the store as well. While many Apple Stores are designed to support tourism industries, the one on Boylston Street has a local draw, as its very near to the Berklee College of Music and a convenient location for the thousands of students who call Boston “home” for at least four years. If you go to this Apple Store location you might see memorials or reminders of a tragedy in the vicinity. Monday, April 15, 2013 marks a somber anniversary in the Boylston Street neighborhood as that was the day of the Boston Marathon bombings which killed 3 spectators and injured almost 180. The Apple Store Boylston Street was only about 500 feet from the second bomb and temporarily had to close its doors. The glass windows were rattled, as were the employees and customers. The store reopened on April 24th, but the neighborhood still bears the symbols of a community remembering. The store is located between Fairfield and Gloucester Streets, just across from the Prudential Shopping Center and off of the Massachusetts Turnpike at exit 22. There is ample parking available for visitors beneath the Prudential Center. Customers can also access public transit on the Massachusetts Bay Transportation Authority (MBTA) Green Line to Copley, Hynes, or Prudential. The Orange Line takes passengers to Back Bay Station.